B U B B L E G A R M: Mac Spring Colour Forecoast and Too Fabulous haul with swatches! Mac Spring Colour Forecoast and Too Fabulous haul with swatches! This morning I woke up at 8am which is unheard of in my book for a Saturday. I was having withdrawal symptoms over 'Ripe Peach' brush ombre from the Spring Colour Forecast collection. I needed to see what the fuss was about and headed to the Mac pro store in London. I was there 1 hour before it opened, talk about 'eager', and spotted staff waiting to go in. I was told 'Ripe Peach' sold out yesterday. I'm like: WHATTTT! I speed walked to Selfridges, and a MA told me they sold out yesterday but, they had a delivery this morning. *Fireworks! 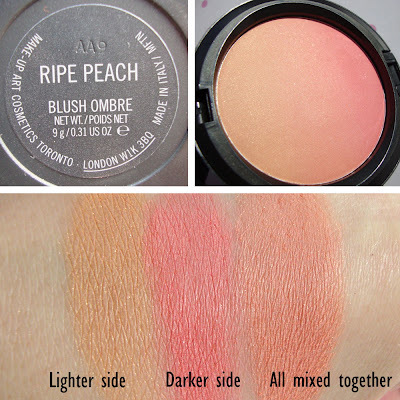 * When I saw 'Ripe Peach' it looked like such a practical colour, it's like having 3 blushes in one because of the colour gradient. It's shimmery and not matte, it looks very Spring / Summer, the pigmentation is excellent as is the texture. Nars 'Gina' is a matte peach colour, Illamasqua 'Lover' is a matte pastel peach colour. They all look quite similar in the pan, but once swatched look totally different. Clearly, the lighter and darker sides of 'Ripe Peach' have no connection to 'Gina' or 'Lover'. A 100% dupe for the darker shade of 'Ripe Peach' is Illamasqua 'Rude' cream blush. I forgot to include it in the picture! 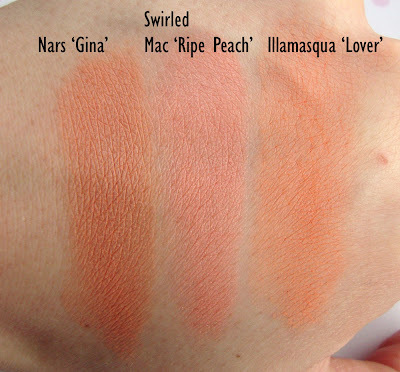 If you look at a closer swatch of 'Ripe Peach' all swirled together next to Gina & Lover, there is a connection. But, clearly not a dupe, 1) because of the shimmer factor and 2) because 'Ripe Peach' has a sweeter pink undertone. I'm SO happy I have it in my collection, it's going to get a lot of love! I also purchased 'Ember Glow' lipglass from the colour forecast collection, I wanted this SO badly. I'm such a peach'aholic. Ember glow is not as pale as Underage, and not as bright as 'Pink lemonade'. It's a lovely peachy in between. It's a very wearable pretty neutral shade. I think I want a backup of this, and I NEVER want or own any backups. 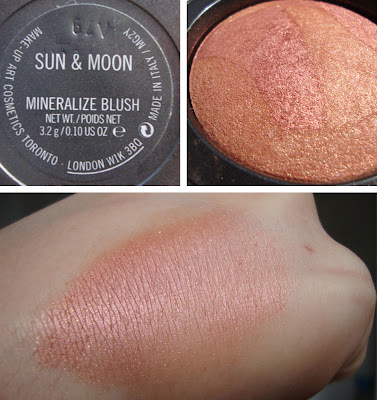 'Sun and Moon' mineralize blush was the only thing I purchased from the Too Fabulous collection, this colour was too unique to miss. It's a beautiful pinky coral shade with a golden bronze sheen. I think it's the prettiest colour I own, even nicer than 'Ripe Peach'. What did you pick up from Spring Colour Forecast and Too Fabulous? 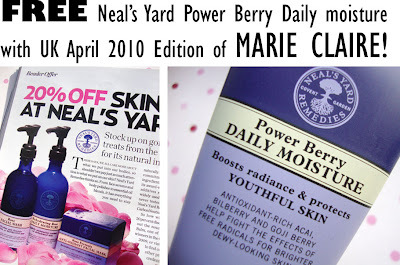 So I walk in to Tesco's and see that this months UK edition of 'Marie Claire' magazine with Diane Kruger on the cover, has a free Neal's Yard Daily moisture cream worth £10.50. It also includes a 20% coupon. Can today get any better? :) Grab yours! P.D. I consider you quite an expert in Neals Yard, and I would like to ask you for advice regarding a moisturizer for a sensitive, dry, acne prone skin... I would love to try Neals Yard!! I'm so tempted by all these new MAC collction posts but I'm trying to be good. Might splash out on a Marie Claire instead! oooh, love your new goodies! Those peaches will be perfect on your beautiful skin! Love the 3-in-1 combo...I cannot wait for the London collection! 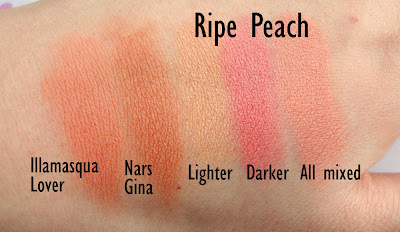 Great swatches, you have convinced me that I need Ripe Peach but now it's sold out everywhere! Might try the Illamasqua Lover, thanks! wow lovely post gurlie :) thanks a lot for the swatches and the dupes! 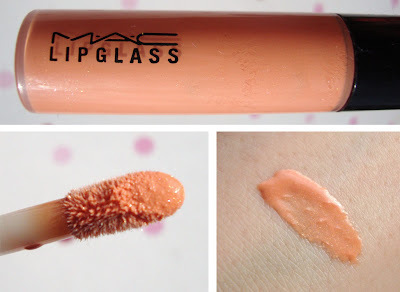 wouldnt Mac peaches or Eversun be a possible dupe? OMG that's a gorgeous blush. I love how its like 3 blushes in one. I love the swatches you posted. They are very helpful. I'm glad you found the swatches helpful :) Always a pleasure, I love taking photos! @scarlettholly the gold dust lipglass looks so pretty, I also loved the rhapsody in two - I actually still want it but have to stay controlled!!! I still think I prefer 'Moon river' mineralised grand duo more, but that looks like a close 2nd!!! I'm so sad that I missed out on Ripe Peach. All my blushes are pink, well, plus one plum. I would really like a peach one. i was just wondering if u have tried the Neal's Yard Daily moisture cream yet. if u have, is it any good?